Republican (Term Expires: 2020) serving Berks (part) and Schuylkill Counties. Pennsylvania State University, Ph.D, Public Administration, 2006. 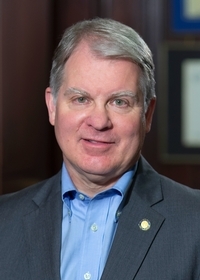 Senator David G. Argall represents the 29th District in northern and western Berks County and all of Schuylkill County, 1,178 square miles containing 95 municipalities from Spring Township to McAdoo. Senator Argall serves as Chairman of the Senate Majority Policy Committee and is the first member from the 29th District to serve in a leadership position in the State Senate since 1861. As the proud grandson of local Cornish, Welsh, and German farmers, coal miners and factory workers, Senator Argall’s top legislative priorities are promoting job growth, eliminating the school property tax burden on homeowners and revitalizing our downtowns and older industrial areas. He led the successful fight to pass a new anti-blight law which has been hailed as “a significant step forward for Pennsylvania” by newspapers across the state. In the Senate, he chaired a bipartisan Government Management and Cost Study Commission which unanimously recommended more than $400 million in savings to the taxpayer. Senator Argall has also played an active role in conservation initiatives, locally as a volunteer Scout leader and across the state as the author of the Waste Tire Recycling Act, which has helped to clean up more than 95 percent of Pennsylvania’s waste tires. In 2014, the National Eagle Scout Association presented him with the Outstanding Eagle Scout Award for “distinguished service to his profession and community.” Senator Argall earned a bachelor’s degree from Lycoming College, where he earned the college’s highest student award. He earned a master’s degree and his Ph.D. in public administration from Penn State. His doctoral dissertation reviewed the benefits and drawbacks of Pennsylvania’s tax-free “Keystone Opportunity Zones” for economic development. As time permits, Dr. Argall serves as a part-time public policy instructor at Penn State. He has been awarded a “Guardian of Small Business” by the National Federation of Independent Business and a “Defender of Liberty” by the American Conservative Union. Citing Senator Argall’s votes on tax reform, rooting out wasteful government spending and improving the regulatory climate, the ACU said the 100 percent perfect score reflects his consistent support on a wide range of issues. Senator Argall lives in Rush Township with his wife, Beth, and two very active terriers. Their children, AJ and Elise, are respectively pursuing a law degree and a new career in public service. Solving local constituent issues and working on legislation are the primary duties of a senator.